Archive for the ‘Personalized Stationery’ Category. 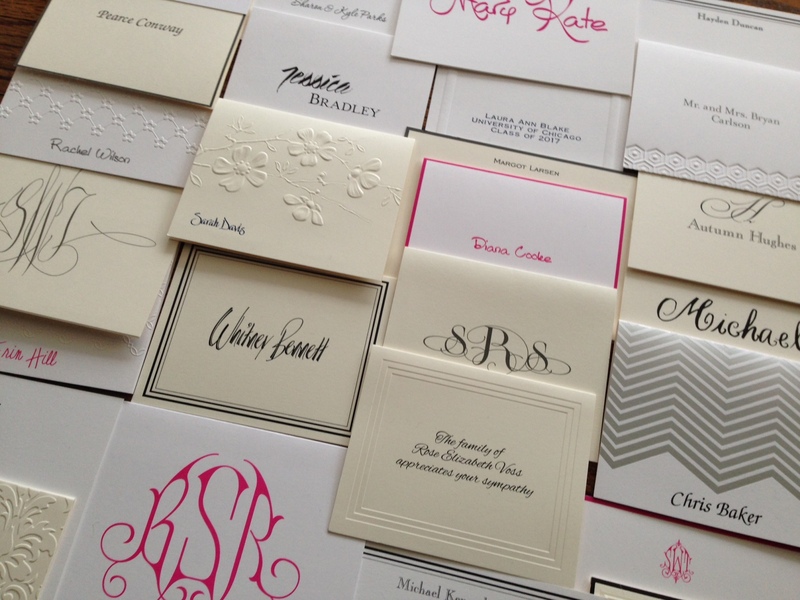 No matter the occasion, personalized stationery is a gift that’s always in style. Why? Simply put, it’s thoughtful and useful. When someone opens a box of custom cards, notes or notepads, he or she gains a tool for correspondence with a little luxury, to boot. Because they feature a person’s name, monogram or messaging, no two personalized stationery gifts are alike. That’s why custom notecards are a one-of-a-kind present. You won’t worry that the recipient gets duplicates. Personalized paper or notecards won’t get lost in the shuffle. Each set is as unique as the person who receives it. When designing personalized stationery for a loved one, you communicate that the person matters to you. How? 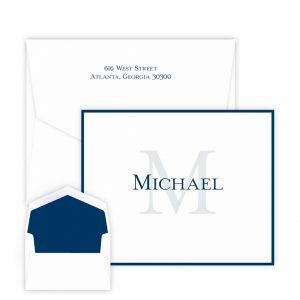 By creating personalized paper, you not only took time and energy to choose a style, but you also input the recipient’s name or monogram. It shows you care. The age-old saying that “it’s the thought that counts” rings true with personalized stationery gifts. They’re proof that you don’t have to spend a bundle to provide someone with a meaningful present. Opening custom-made stationery is always a treat — regardless of its cost. 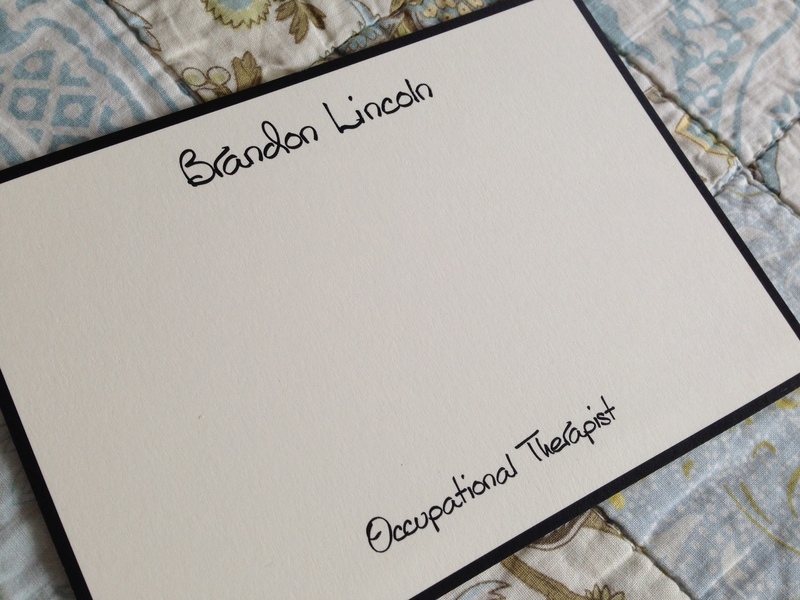 Unlike many generic gifts, custom-designed stationery makes a meaningful impression. It’s not a mass-produced product, but rather a gift tailored to the recipient. That’s why, for as long as the paper lasts, your recipient is sure to think of you. With every handwritten note, he or she has a fresh reminder of your care. Custom-made stationery is hard to forget. Last but not least, getting a custom gift is fun. Who wouldn’t love to open a box of personalized notecards or papers, knowing they were designed with you in mind? When you surprise someone with custom stationery, the gift recipient will cherish it for a long time. Personalized notes are something special in a world of digital interaction. From business colleagues to family members, everyone appreciates being thought of with a personalized gift. To learn more about our tailored stationery options at Giftsin24, browse our website. Think about your recipient’s style and find a design that matches it beautifully. 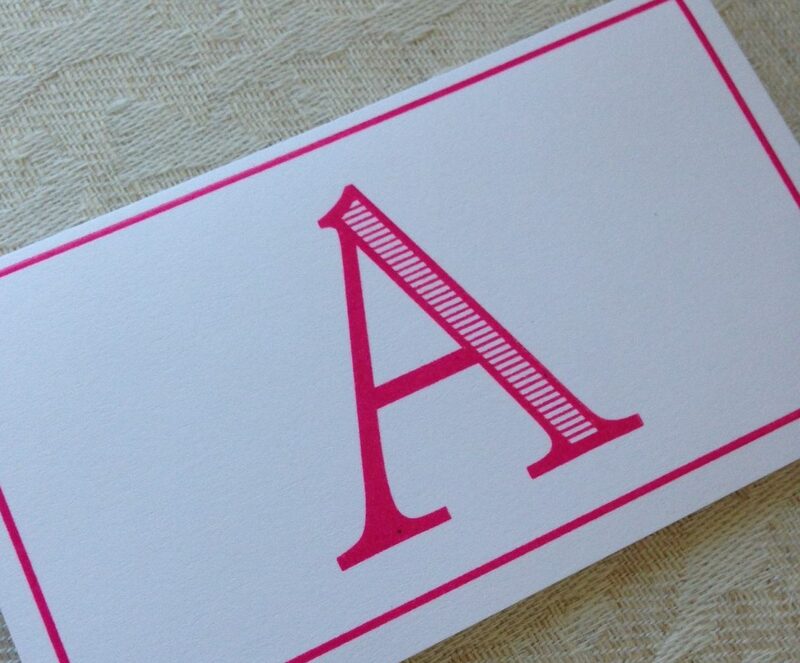 From elegant monograms to colorful borders, we have a wide range of options. Place your order today! Whether you’re sending a note of congratulations or love, there’s nothing like personalized correspondence cards (also called flat cards or notecards) to make it special. Made to reflect your style and name, correspondence cards are elegant enough to be a time-honored tradition, yet meaningful enough to make a heartfelt impression. That’s why, when you are taking the time to handwrite a note, correspondence cards are the perfect way to do it. Use them for sympathy notes, thank you cards, congratulations wishes and more. If you’re looking to create and write the best correspondence cards possible, here is what you’ll want to know. There are certain hallmarks of correspondence cards, traditionally speaking. A correspondence card is a specific size: slightly larger than the modern A6 postcard size. It should also be a heavy enough weight of paper to create a premium feel — ideally not less than 350 grams per square meter (GSM). Include your contact information: usually your name, address and phone number. It may also feature other details such as an email address, a website and/or a social media username if desired. As for the message, write your note on only the front — never the back — of the card, and your writing should be brief and sweet. 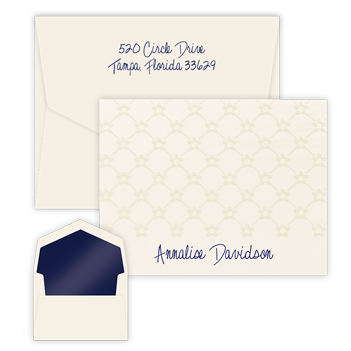 Correspondence cards belong in envelopes printed on high-quality paper. If you really want to make them special, use traditional wax seals. The timing of certain cards depends on the occasion — yet there is always flexibility. Etiquette dictates you should send sympathy cards, for example, within two weeks of someone’s death. At the same time, expressing condolences is still appropriate weeks or even months after that point, as it communicates care to a grieving person. With thank you notes — whether for birthday, anniversary, graduation, shower or baptism gifts — ideally send notes within four weeks of receiving presents. What Makes Personalized Correspondence Cards Special? 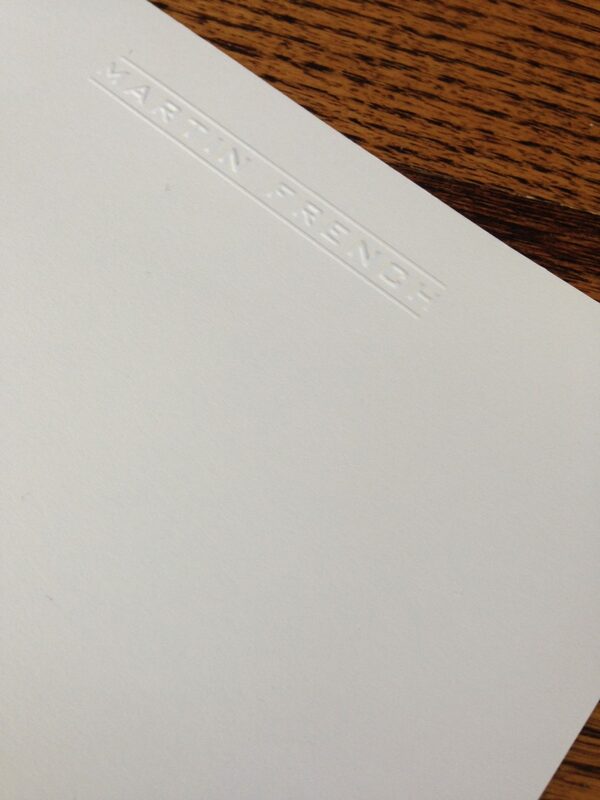 The elegance of correspondence cards is in the attention to detail. Rather than generic paper, they feature heavier, higher-quality paper. This gives each notecard a sense of importance. Likewise, correspondence cards are as unique as you are, made to showcase your style. At Giftsin24, we offer a wide selection of cards to give you plenty of ways to customize them. Create your design with a monogram and choice of lettering. We also offer a variety of decorative elements such as crisp embossing, rich raised ink, borders and more. 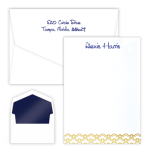 For the best personalized correspondence cards, Giftsin24 is your resource. Our established, family-owned company not only creates the finest cards in the industry, but we also provide a fast turnaround on all designs. Most orders ship within 24 hours, so you can get what you need quickly. We provide free FedEx ground shipping, exceptional packaging and a commitment to order accuracy on every card set. Browse our personalized notecards online and place an order today! Some people are addicted to clothes, cars or food. Others may be in deep for gardening or makeup. And then there are people who are obsessed with stationery. How can you tell if you have a normal appreciation for stationery vs. a full-blown obsession? Take our quiz to find out. Question 1. When is it time to re-order your stationery? A. When I have 5 notes left in the box, it’s time to reorder. That’s about a month’s worth for me. B. When I have 5 boxes that are half-full, it’s definitely time to reorder. It would be full-on panic if I ever get down to only 4 boxes. A. by placing them in a pretty glass or jar on my desk. I like looking at them. B. by arranging them in rainbow order in a special tray in a dedicated drawer designated just for them. Question 3. You follow ___ stationery related accounts on Facebook. A. order a set of monogrammed cards or notes and call it a day. 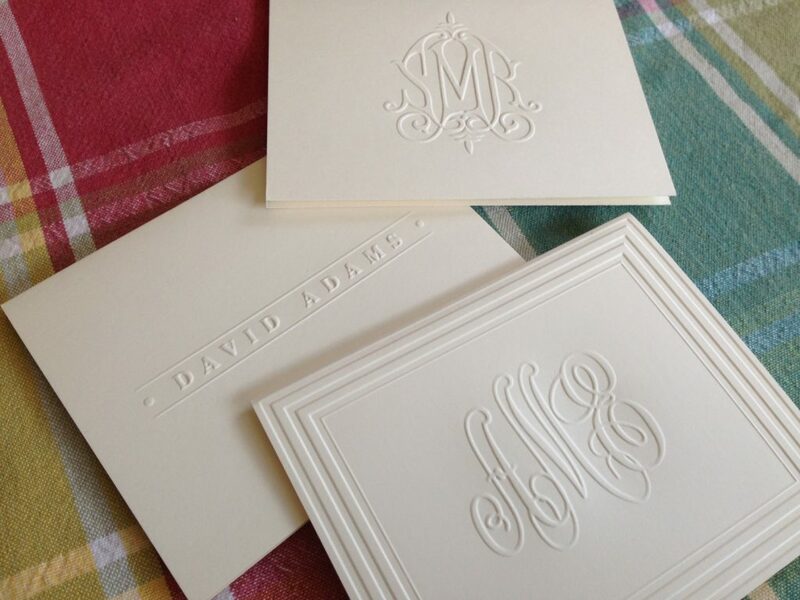 B. order a set of monogrammed cards AND a set of monogrammed notes, plus a coordinating monogrammed notepad. A. Take a hard pass. It’s a sign of bad quality to have ecru notes with white envelopes. B. Never consider purchasing from that company again. How dare they? A. I peel and stick. It will get where it’s going regardless of what the stamp looks like. B. I make an emergency run to the post office. There’s no way that ugly stamp is going on my beautiful, self-addressed, envelopes with hand-inserted linings. A. I’ll take a look. It’s fun to explore new products. B. I’ll seriously consider buying one, especially if it’s brand-new, hot-off-the-shelf. Variety is the spice of life. 1-2 Bs…you have a mild stationery obsession, but nothing out of the ordinary. 3-5 Bs…you are obsessed with stationery and seek ways to indulge your habit. 6-7 Bs…congratulations, you have a profound obsession with stationery. Need a stationery fix? Explore new designs here. This is the time of year when our thoughts turn to spring. Whether you are in the deep freeze up north, or beginning to see the trees budding out in the south, right about now, everyone’s had about enough of winter. So, naturally, we here at Giftsin24 think about new stationery designs and patterns, in anticipation of all the excitement soon to unfold outdoors. Here is some of our new stationery for spring in your choice of vivid raised-ink colors. These new designs have personalities all their own. You’ll see that we’ve added new twists to some favorites and have created beautiful new lettering styles for completely new looks in others. And we’ve given them wonderful names, some of which are exotic and fun. They are all printed in your choice of raised-ink color. Whether you choose bright and sassy –think fuchsia, emerald green, ocean blue, red or purple — metallic — think silver or gold — or traditional and true — black, mocha, navy or slate — this stationery will bring you a breath of fresh spring air. Classic Frame Monogram Note features our beautifully embossed frames with a precision-printed raised ink monogram. Classic Frame Monogram Note – Raised Ink. We’ve given our Classic Frame Monogram note a re-fresh for 2018. We’ve combined our traditional embossed frame with a raised-ink monogram. This folded note is perfect for peole who are a little bit traditional AND a little bit daring. 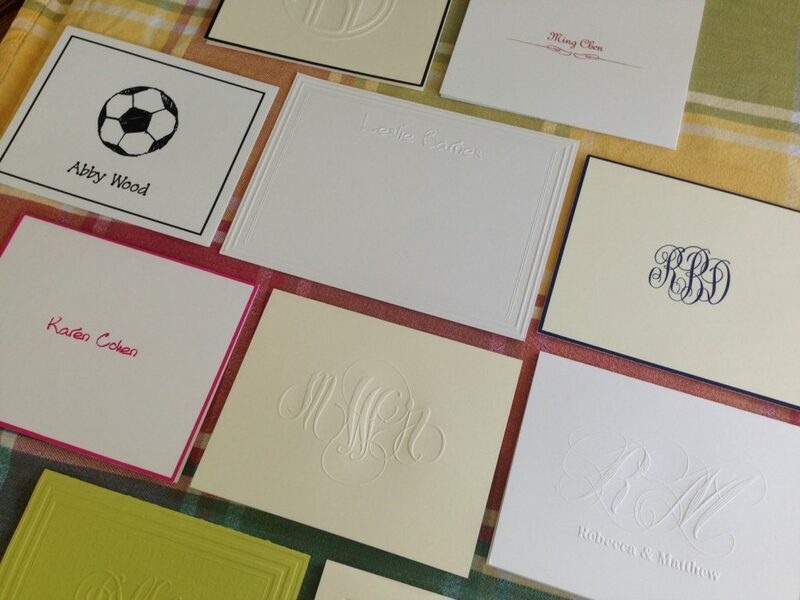 Enjoy a choice of ink color and paper color as well as 5 monograms: Classic, Circle, Whitlock, Sydney, or Diamond. Spring Blossoms Note – Raised Ink A cheerful spray of cherry blossoms gives this folded note a happy vibe. Choose a lettering style and ink color, and we will print your name in vivid raised ink over a lighter version of the same color. Add coordinating hand-inserted envelope linings to boost the happiness factor. 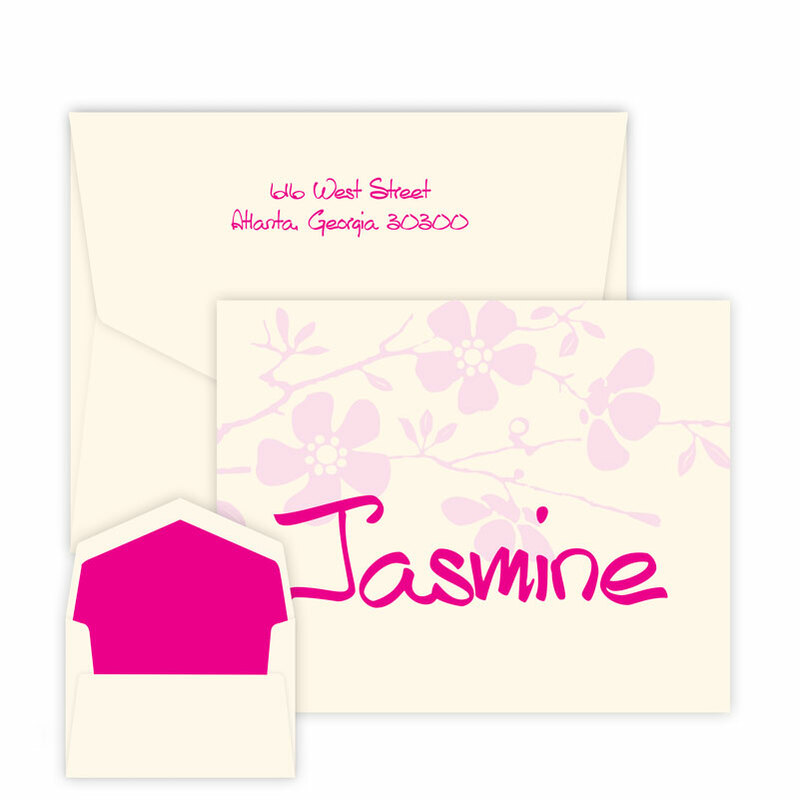 Magnolia Note features a screened back, large initial with your name transposed over it. Magnolia Note. This handsome notecard offers many ways to create stationery that reflects your personal style. 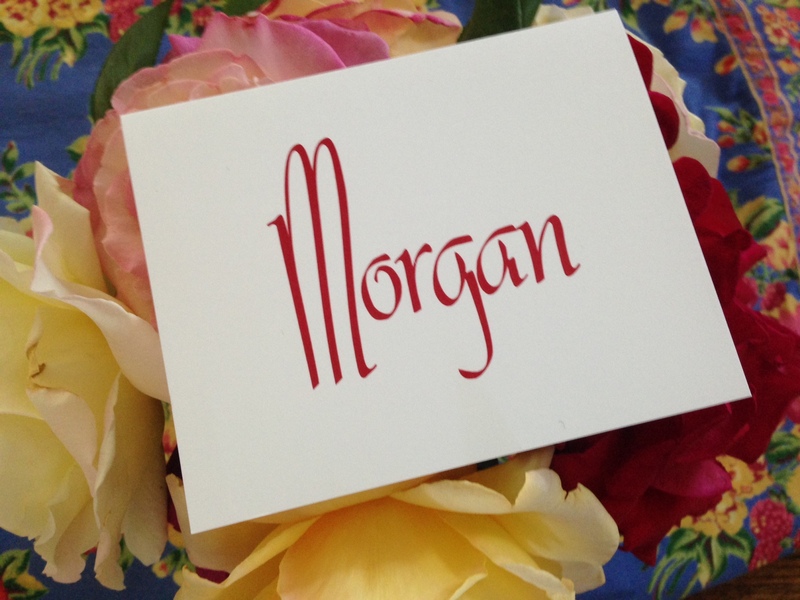 The Magnolia Note offers a choice of lettering style with one line of raised-ink personalization, plus an initial printed in a lighter shade of the same raise ink color selection. 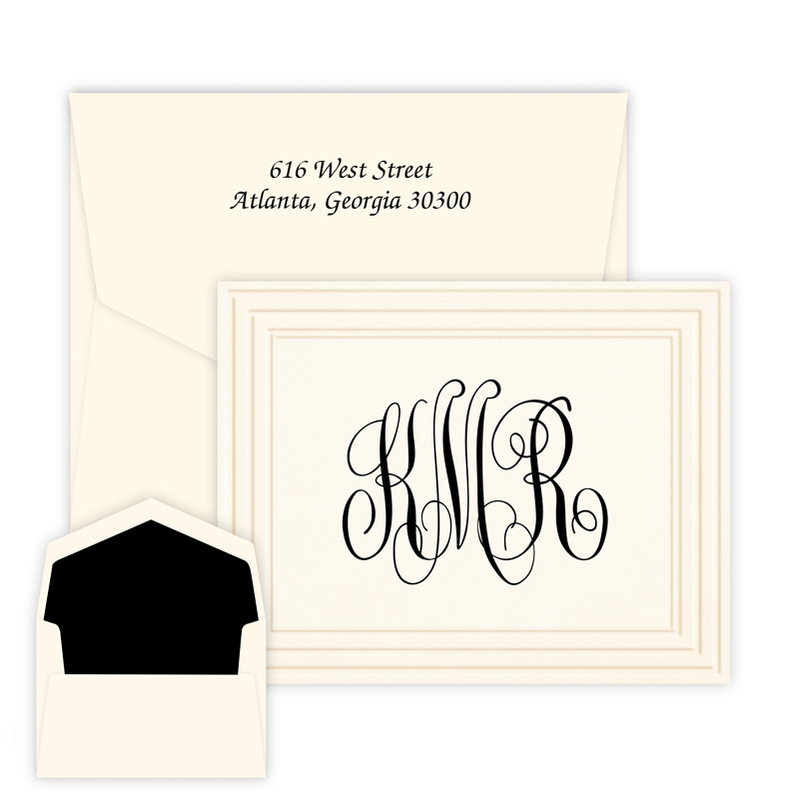 Cristobal Monogram Card offers several new lettering styles for your monogram in the lower right corner. Cristobal Card. Amp up your correspondence with the Cristobal Card, offering five masculine lettering styles that imply refinement and strength. Your monogram, printed in your choice of ink and paper color, appears in the lower right. Add an optional colored border to highlight your message. Moderno Monogram Note features a brand new lettering style in raised ink. Moderno Monogram Note. With its clean lines and Mid-Century feel, the Moderno Monogram Note imparts a sophisticated impression. This folded note offers a choice of ink and paper color. Add an optional coordinating lining paper to up the wow-factor. What do you think of our new stationery? We’d love to hear from you! Tell us your favorite design or lettering style. In addition to these five new stationery sets, we’ve also created a number of new party napkin and guest towel designs. See these and other new products in our New Selections area of our website. As some of these lettering styles become more popular, expect to see them on our engraved gifts and personalized notepads. You would never walk out of the house without at least a quick thought to your appearance. The same goes for sending correspondence out into the world. The best and easiest way to be sure your messages make your best impression is to create a social stationery wardrobe. Build a social stationery wardrobe with pieces that you love. After all, just like your clothing wardrobe, your stationery represents you in the world, so you should feel proud of the way it fits your unique style. And remember, quality stationery stands the test of time. While many of your missives will be discarded, some will be kept for years, maybe decades or even centuries! If you need to write just a couple of lines, a flat card is the perfect tool. Need to send your father-in-law the belt he left at his last visit? Slip in a flat card with a quick hello. Want to send a memorial donation in the name of a friend’s sister? Write your instructions to the charity on a flat card and include the check. Anytime you need to send a casual, brief missive, the flat card works beautifully. 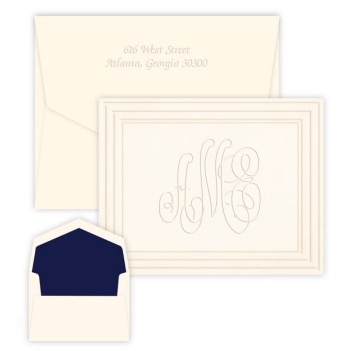 How to use: Write your brief message on the side of the card that shows your name or monogram. A folded note is slightly more formal. It’s perfect for one of the most common social tasks we perform (or should be performing, ahem! ): the thank you note. Folded notes give plenty of space to express gratitude for a wedding, birthday, Christmas, anniversary or baby shower gift. Folded notes are also perfect for acknowledging the nice things that people do for you. It could be that referral that a client made on your behalf. Or the wonderful dinner party you got invited to. Ask yourself: “Did someone spend time and effort to do something just for me?” Return their energy by writing a thank you note on a folded note. 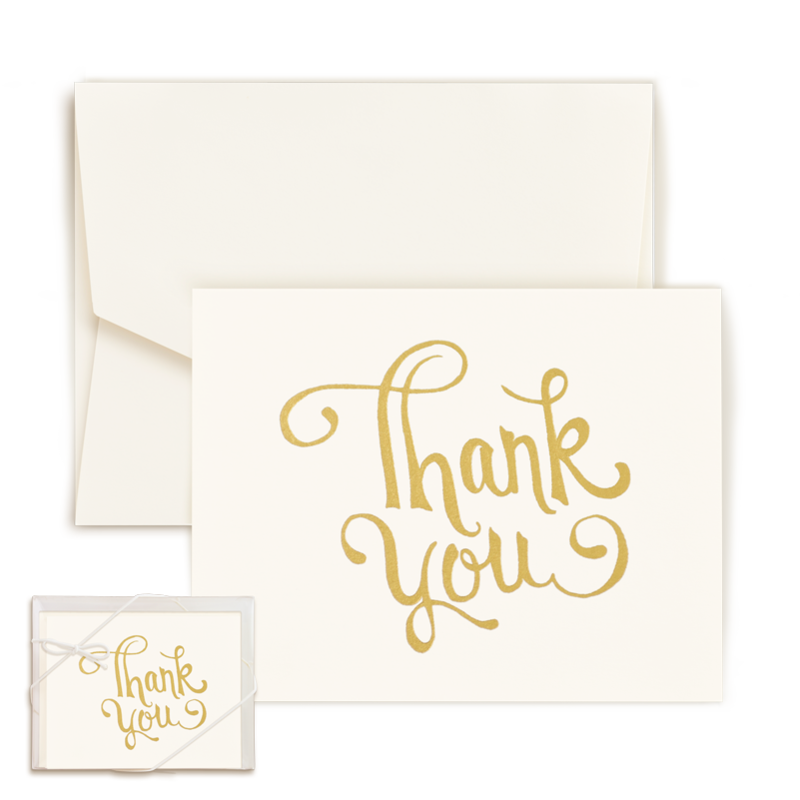 And using polished and professionally made thank you notes can be rewarding in other ways: If you are on the job hunt, doing job interviews or attending sales calls, that embossed folded note could make or break a potential employer or client’s impression of you. How to use: Start on the lower inside panel. If you need more space, move to the upper inside panel. If you are writing a message of a few paragraphs or more, use writing papers, also called letter sheets. 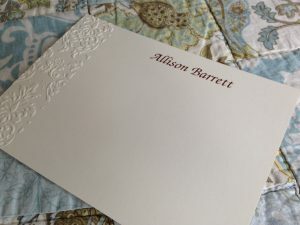 Whether you are channeling your inner Jane Austen or simply telling your college bound daughter how much you love her, writing sheets emblazoned with your name or monogram are the perfect touch. Accompany the paper with matching envelopes and a pretty stamp, and you will create correspondence worthy of being handed down through the ages… or at least saved for a little while. How to use: Write on the front of the paper only. Use a blank sheet for the second page and find your best pen filled with blue or black ink. Whether you are giving a bottle of wine for getting that big sale or offering a gift to your evening’s host, a gift enclosure is your tool. Keeping a well-stocked stash of these around will help you avoid a last-minute scramble to the drug store. A well-crafted enclosure ensures that every gift is presented beautifully. How to use: Brevity is your friend here. Sign your name under a brief greeting: “Thank you!” “I love you” “Happy Birthday,” etc. You can put together a beautiful stationery wardrobe using individual cards, notes , writing papers and enclosures that you love on their own. Buying individually gives you more flexibility and design choices. You can select pieces that are on trend, traditional designs or a mix of both. Henley Monogram Wardrobe. 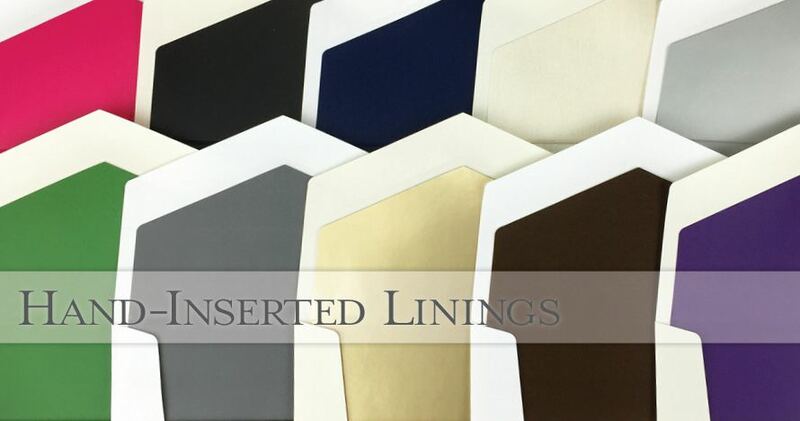 This graceful assortment of embossed papers gives you many options to fit any occasion. 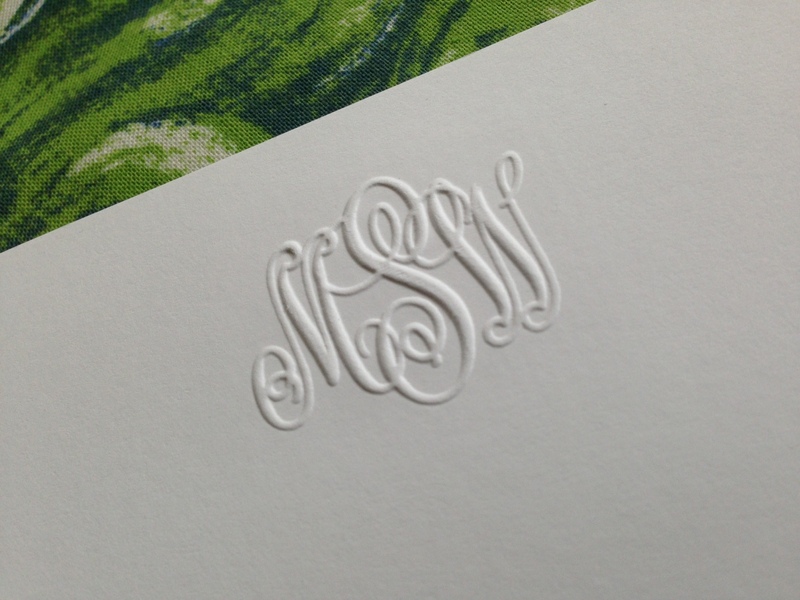 Featuring your beautifully embossed monogram on high quality paper. Includes choice of monogram. Each Monogram Wardrobe set includes 50 letter sheets, 50 folded notes, and 50 enclosures with 150 paper-matched envelopes. Choose a return address or hand-inserted lining to make this set complete. Supplement with the Delavan Monogram Card to complete your monogrammed, embossed wardrobe. Cove Wardrobe. An amazing value. The Cove Wardrobe has you covered. Be prepared for all of life’s occasions with a letter sheet, folded note and gift enclosure. Beautifully embossed in a bold, pleasing lettering style. 150 pieces, total, with 150 color-matched envelopes. Choose a return address or hand-inserted lining to make this an extra special gift. Add the Corridor Card to complete the set. Somerset Wardrobe. The Somerset Wardrobe features three sizes of single panel cards (Apex, Correspondence and Enclosure) in your choice of ink color and lettering style. Containing 150 pieces, plus 150 matching envelopes, this set will cover all your casual stationery needs. Optional hand-inserted lining and return address on the envelopes. Supplement with the Somerset Letter Sheet to complete your raised-ink wardrobe. “A WOMAN is known by the stationery she uses. Paper talks. We read between the lines, along the margin, and across the envelope, the story of good or bad taste which speaks in tone, texture and design.” So opens A Desk Book on the Etiquette of Social Stationery published in 1910 and written by Jean Wilde Clark. What was true then, with a slight tweak, is still true today. Our stationery can speak worlds about us. What’s changed? “The Rules,” or stationery etiquette, are more relaxed: we no longer must use black-bordered mourning stationery after a loved one’s death, for example. In addition, we can all agree that men have just as much of a need for stationery, and that their stationery choices speak for them too. What’s more, in this age of fast fashion, speed-of-light communication across the globe, what’s “In Style” changes on a dime. And that makes us lucky: there’s no need to cram our taste into rigid expectations of what’s proper or even what’s in style. Sure, white or ivory paper will always be correct. But if you want to use red pepper, who will care? Citrus paper? Be my guest. The fabulous Jackie O used robin’s egg blue paper. If she could do that in the 1960s, the sky is the limit for us in the late 2010s. On the one hand, the lack of stylistic expectations is liberating, because it means we have the freedom to choose whatever stationery suits us. On the other hand, it can be slightly intimidating, because we’ve got almost unlimited choices. Let it be your style. There’s one rule to follow in 2017/2018: You be you. Don’t worry about what a friend is doing, or what you saw in a magazine. Not sure what you like? Look at the furnishings in your home and the clothes you wear. Do you tend toward traditional (try a 3-letter monogram), primitive country (try a quirky or hand-lettered font), or contemporary (try your name in block letters)? Like neat, clean surfaces (look for simple lettering) or do you like to cram every nook and cranny with beloved objects (look for curvy, embellished designs)? Do you like to follow the rules (center the personalization at the top) or do you like to push them (personalization goes in a corner or at the bottom)? What colors do you like to surround yourself with? Pastels? Metallics? Jewel Tones? Neutrals? Take advantage of the preview function when considering lettering styles for your name. Scrutinize the way your initials look – perhaps you like one font’s S better than another? These are great clues to help you pull together your stationery style. In the end, whatever you choose will be perfect, because you chose it. When you’re writing a note to your pastor, the school principal, or your favorite author, you might want to consider a more formal letter sheet or correspondence card that tends toward business-like. Perhaps it’s embossed. Perhaps it’s on white paper with gray ink. Or ivory paper with coffee ink. This stationery might include your middle initial and the formal version of your first name. It will work equally well for when you’re sending a gift to your best friend, writing to your brother, or thanking your neighbor for her homemade scones. Or, for those more personal uses, you could purchase a second set that reveals your more relaxed side. Any form — letter sheet, flat card or folded note — will do. Perhaps there is a small illustration, or your nickname, rather than your given name. You might use colored paper with black or metallic ink or a more brightly colored ink on ivory paper. It’s really a matter of choice. Raised-ink printing, or thermography, is a more affordable version of engraving. Engraving, a centuries-old printing method, requires the creation of dies, which are expensive to produce and reside at the stationery company until you require more stationery. Raised-ink printing conveys a pleasing texture and a shimmery quality to the ink. 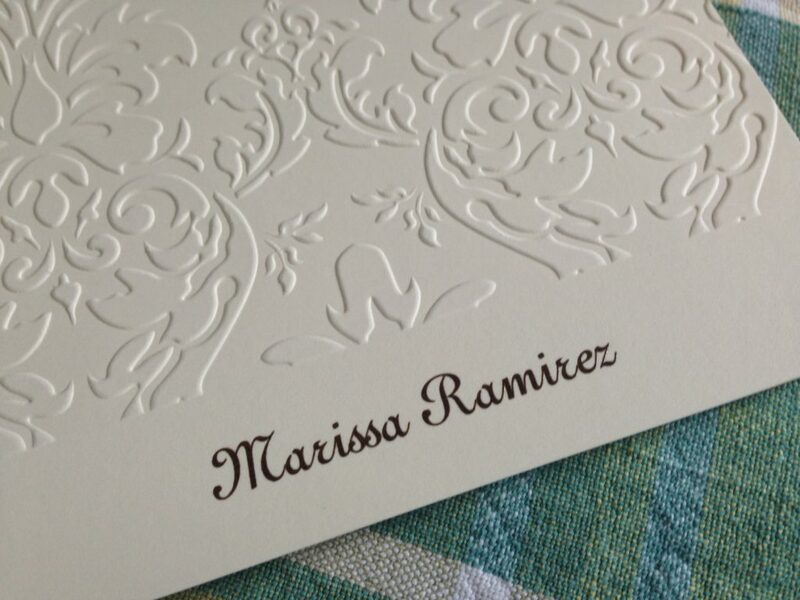 Embossing lends an even more delicious texture because the paper is pressed from below. In that sense embossing resembles traditional engraving, as well. 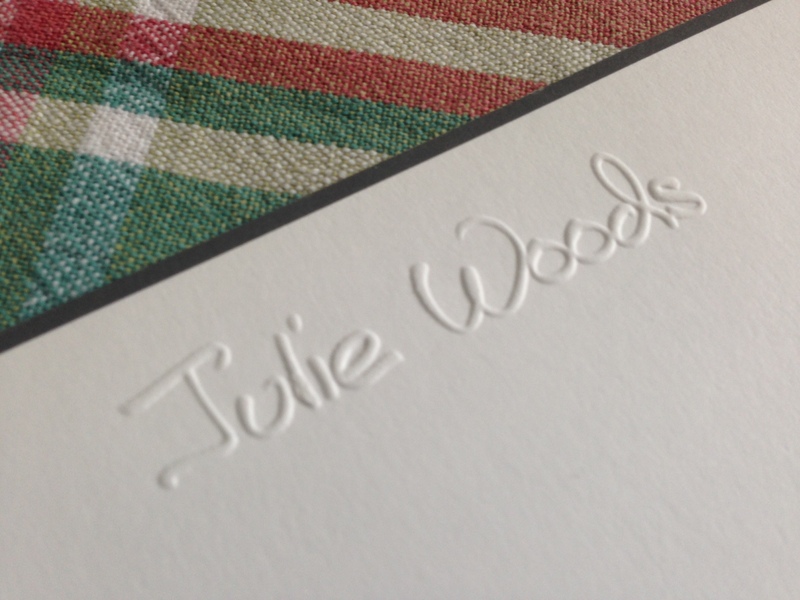 Especially on white or ivory paper, embossing tends to be more formal. It also tends to be more earth-friendly, because the paper recycles easily. So to recap, choosing stationery can be an enjoyable and fulfilling exercise. Taking time to think about your style and consider your options will reward you each time you sit down to write. 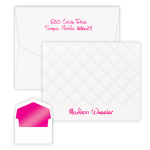 See all of our personalized correspondence cards and folded notes. Happy choosing! Stately Wine Glasses make beautiful gifts for graduates. It’s that time of year: Graduates line up for hard-won diplomas, while proud parents look on. Giftsin24 makes it easy to find gifts for graduates that reflect their accomplishments. 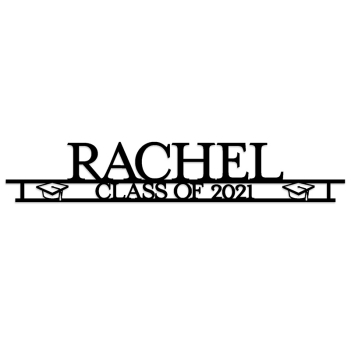 Because our gifts are personalized or monogrammed, grads can instantly see the care and thought you put into the gift. But don’t worry, we won’t tell them how easy and fast it is to order from Giftsin24! Some of our newest products strike the perfect note as gifts for graduates. Explore our engraved glass barware, including wine glasses, shot glasses, beer mugs, mason jars and more. A variety of designs can show off names, initials and graduation years. Personalized stationery is always a winning gift, especially as it can help graduates during that all-important job search. 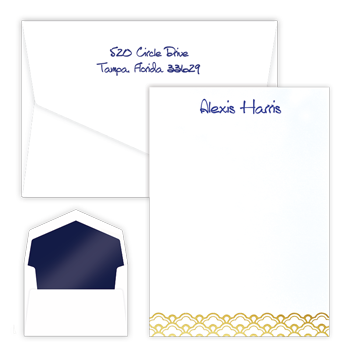 Monogramming, embossing, raised ink and upgrades such as lined envelopes are all beautiful touches. We also have a variety of keepsake ornaments that fit the bill. Here we present five affordable gift ideas that earn an A+ from newly minted grads. Graduate Wall Sign This is one of our favorite new gifts for grads. Any graduate would love to show off his or her accomplishment with this precision-crafted, personalized wall or shelf sign. It offers two lines of text (up to 20 characters each) in a choice of font, plus mortar board artwork. Display it on a desktop or shelf with attachable supports or hang it on a wall with four wall-safe adhesive mounting squares. Miramar Wine Glass Encourage the graduate to kick back and enjoy life after all their hard work at school. Personalize this 11 ounce wine glass with up to three lines of text in your choice of lettering style, plus a choice of motif, including fleur de lis, grapes, crab, palm trees, captain’s wheel, anchor, chair, flag and star. Clear glass. Dishwasher safe. This design also comes in a stemless wine glass. 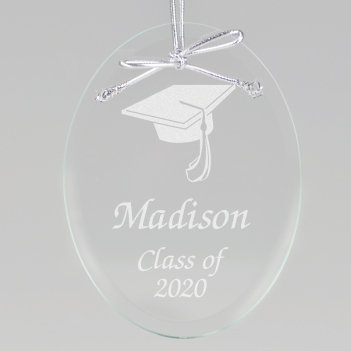 Graduation Cap Keepsake Ornament Long after the sounds of “Pomp and Circumstance” fade, the graduate will have this special glass ornament to remember that proud moment. Planning a graduation party? Use this ornament as stylish place cards, party favors or a gift tag. Precision-crafted from clear glass with a beveled edge and a subtle jade tint. Includes silver ribbon for display and a black velvet pouch for safekeeping. Classic Frame Monogram Note A thank you note after a job interview can make or break the graduate’s chances for landing the job. Beautifully crafted stationery can help the graduate polish their professional image. This note is simply gorgeous, bringing a refined design together with the smooth and carefree lines of a script monogram. Choose crisp white or classic ivory paper. 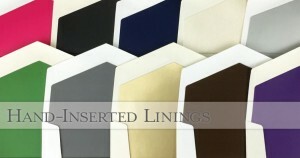 Includes 50 color-matched envelopes. 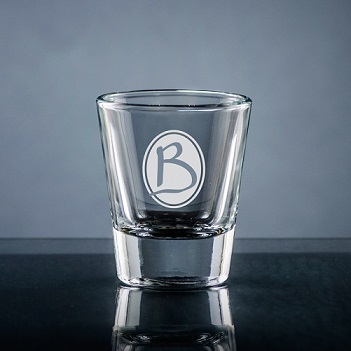 Soltero Shot Glass is one of our favorite gifts for graduates. her first job with a bottle of great liquor and this beautiful, engraved shot glass. A stylized oval highlights his or her initial on the clear glass. Choice of font. Dishwasher safe. Store shelves may be looking a little bare. And online shops are selling out. But, there’s no need to settle for a less-than-perfect gift, because here at Giftsin24.com, we have an endless supply of last-minute gifts. We have lots of paper to make delicious stationery and matching envelopes. And we’re so quick, we can make your gift in 24 hours and ship it out the next day. So that means that if you are seeking that perfect gift that looks like you planned it months ago, we’ve got it. Here are some of our newest designs reflecting the latest, up-to-the-minute trends. We’ll customize these with a name or monogram, ink color and paper of your choosing. You can also add goodies like an envelope lining or return address. We’ll make the gift lickety-split and ship it free (if ordered before December 21; otherwise we have 1 and 2 day shipping options) to you or your gift recipient to arrive before Christmas. It’s so easy. And best of all, your friend or family member will feel delighted — and you will feel proud. Needlepoint Note – Triple Thick. 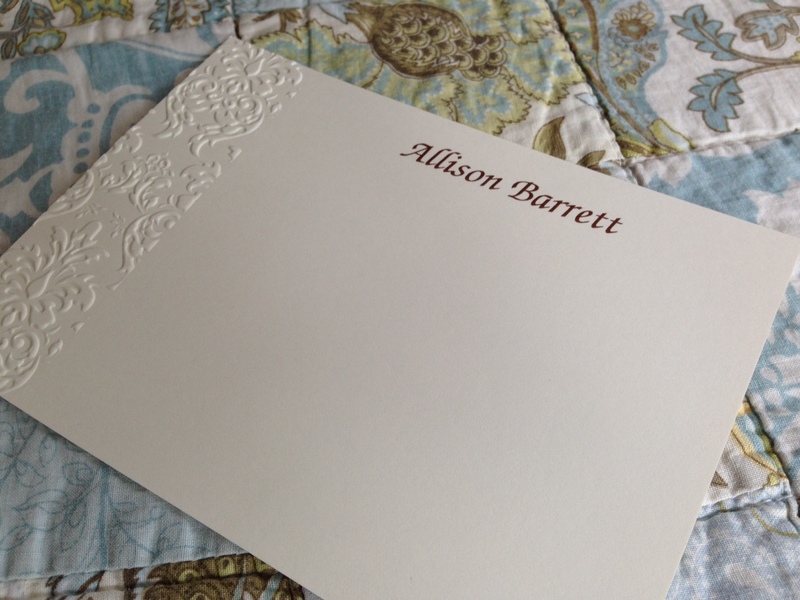 An update on a traditional design, our embossed Needlepoint Note conveys a quiet gracefulness. Embellished with a thermography personalization, which imparts subtle shimmer, this folded note makes a stunning gift. Comes with 50 Pinnacle pointed-flap envelopes. Opt for the hand-inserted lining to make it even more special. Sonata Note – Triple Thick. The Sonata Note features a crisscrossing daisy motif embossed into triple-thick paper. A softly shimmery raised-ink personalization adds even more sophistication. Comes with 50 Pinnacle pointed-flap envelopes. Opt for the hand-inserted lining to create a luxurious gift. Centric Card. Enjoy the art deco design of the Centric Card. The foil design in your choice of gold or silver adds a touch of elegance. Raised-ink personalization. Choice of typestyle. Comes with 50 Pinnacle pointed-flap envelopes. Opt for the hand-inserted lining to create a very special gift. Montauk Note – Triple Thick. Chevron patterns are hot, and so is our Montauk Note. 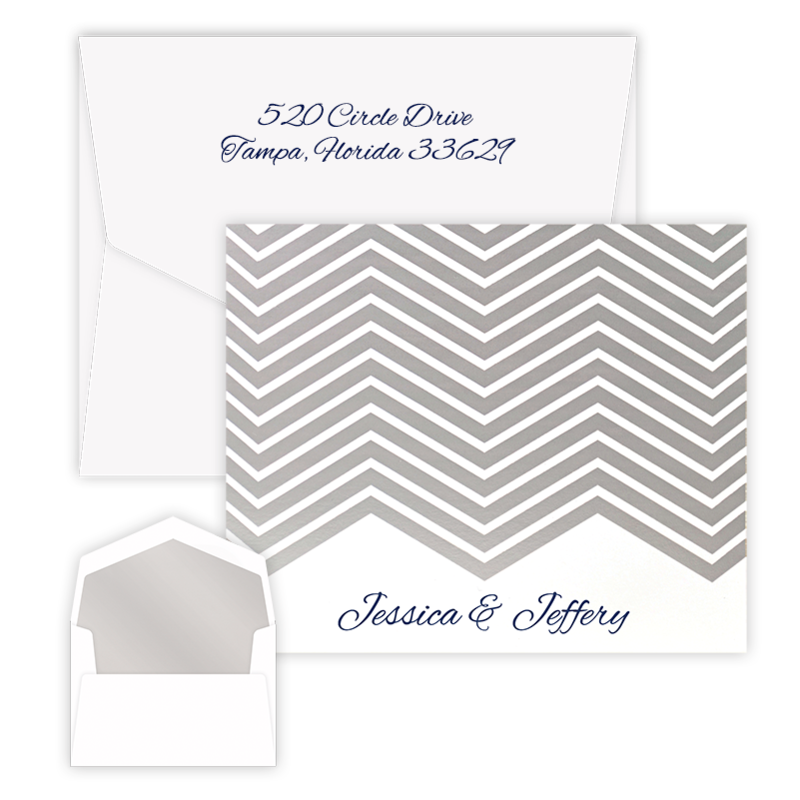 The zigzag design is foil-pressed in your choice of gold or silver, and the raised-ink personalization ups the glamour factor. Comes with 50 Pinnacle pointed-flap envelopes. Opt for the hand-inserted lining to create a luxurious gift. Infinity Note – Triple Thick. The Infinity Note features a distinctive diamond pattern in a gold or silver foil. The triple-thick paper is also embellished with a raised-ink personalization in your choice of colors. Comes with 50 Pinnacle pointed-flap envelopes. Opt for the hand-inserted lining to create a luxurious gift. See more of our newest products here, including picture frames, ornaments, notepads and more stationery. Happy giving! Notice something new? You’ve asked for it, and now we have it: pointy flaps on our envelopes. Here’s our new Pinnacle envelope posing with our new Needlepoint Note. You’ve been asking for it, and now we have it! We’ve pumped up the pretty with our new pointed-flap Pinnacle envelopes. To add even more sugar to the mix, we are introducing 10 new lining papers that we are hand-inserting. Everyone loves a little luxury. That’s why we’ve added these new features to dozens of our most popular products. 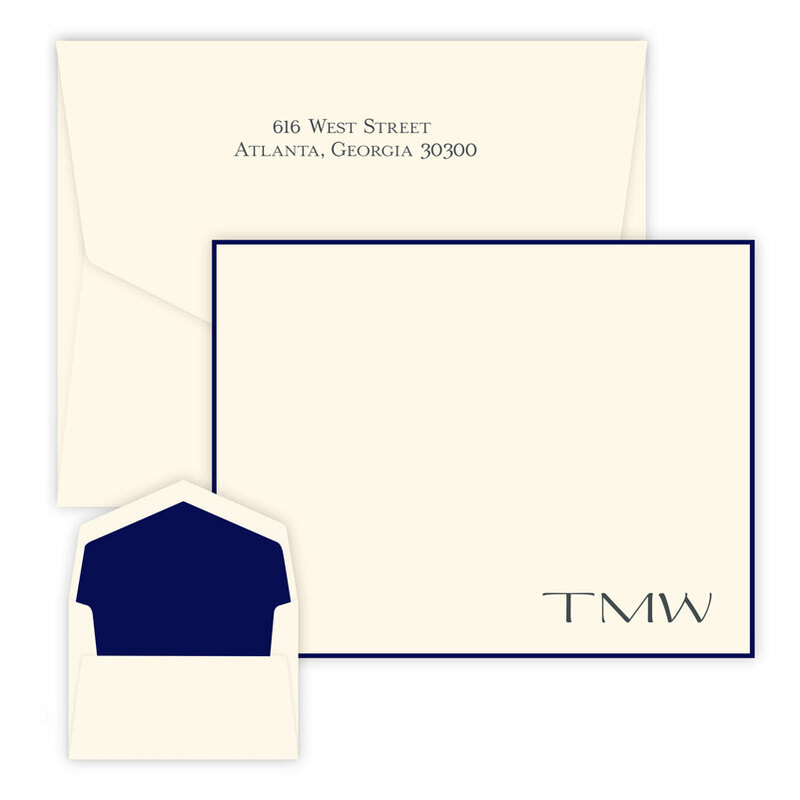 Our Pinnacle envelopes feature a newly designed flap that’s sure to please. Like all of our envelopes, our Pinnacle envelopes are made in-house, at our state-of-the-art facility in Aurora, Illinois. We make the envelopes out of the same paper as our stationery, so your stationery will always match the paper of your envelopes. And here’s even more good news: we’ve selected 7 vivid solid papers and 3 elegant foil papers as linings that we hand-insert into the envelopes. These gorgeous linings coordinate with any of our 11 raised ink colors and 6 border colors. Oh la la, these new features make our classic stationery even more yummy. See more stationery with our Pinnacle envelopes and hand-inserted linings. 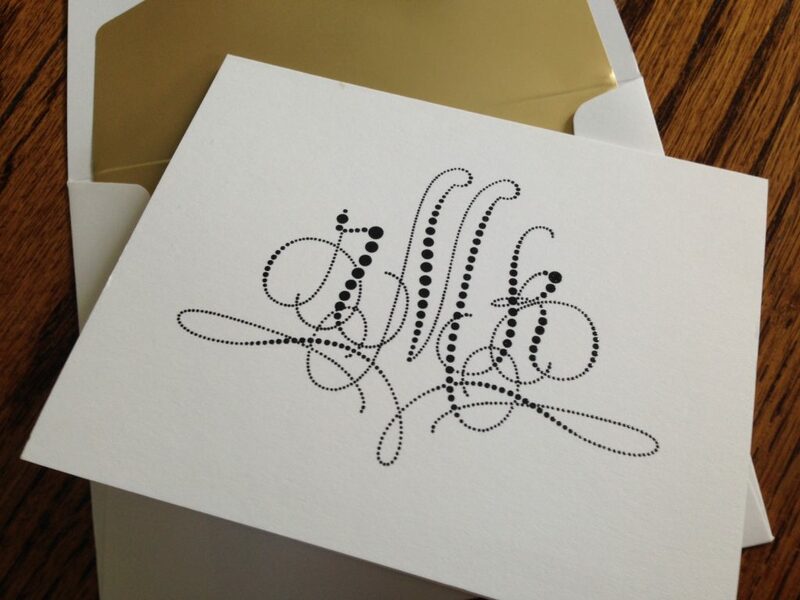 Add sparkle to your thank you notes with our new foil-pressed, hand-lettered line of stationery. Impress your friends and please yourself. The answer was a resounding “NO.” But you, wonderful and smart Giftsin24 customer, already knew that, didn’t you? Because thank you notes are so important, we are giving you even more choices with beautiful new designs, including a number of foil-pressed papers that you will be proud to send to your most style-conscious friends. These snail mail thank you notes are precisely crafted from the finest papers and foils, and reflect our 40 years of expertise in the stationery business. The typesetting is beautifully spaced, the letters expertly designed. And, the foil is spectacular. Thank You Script Note An elegant hand lettered design in gold foil makes the Thank You Script Gold Foil Note perfect for expressing your most heartfelt thoughts. Triple-thick, ivory paper. Includes 8 Pinnacle, pointed flap envelopes. Arrives in a clear plastic package bundled with a white elastic band. Thanks a Million Note Convey your heartiest thanks with the hand lettered Thanks a Million Gold Foil Notes. These folded notes feature a chic, hand drawn, design in gold foil and triple-thick, ivory paper. Includes 8 Pinnacle, pointed flap envelopes. Arrives in a clear plastic package bundled with a white elastic band. 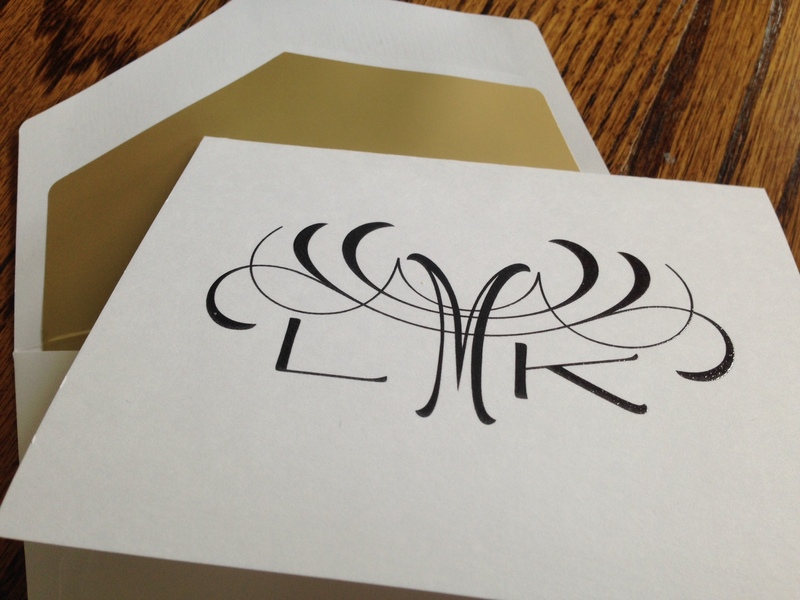 Our Montauk Note comes in your choice of silver or gold foil. The personalization is in raised-ink. Montauk Note Chevron patterns are hot, and so is our Montauk Note. 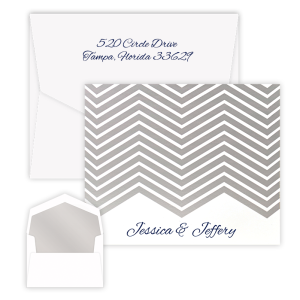 The zigzag design is foil-pressed in your choice of gold or silver, and the raised-ink personalization ups the glamour factor. Comes with 50 Pinnacle pointed-flap envelopes. Opt for the hand-inserted lining to create a luxurious gift. Centric Card Enjoy the art deco design of the Centric Card. The foil design in your choice of gold or silver adds a touch of elegance. Raised-ink personalization. Choice of typestyle. Comes with 50 Pinnacle pointed-flap envelopes. Opt for the hand-inserted lining to create a very special gift. Infinity Note The Infinity Note features a distinctive diamond pattern in a gold or silver foil tone. The triple-thick paper is also embellished with a raised-ink personalization in your choice of colors. Comes with 50 Pinnacle pointed-flap envelopes. Opt for the hand-inserted lining to create a luxurious gift. Anthem Card Shimmer and shine. The Anthem Card features a vertical orientation, three foil stripes in your choice of silver or gold, and a raised-ink personalization. Comes with our Pinnacle pointed-flap envelopes. Opt for the hand-inserted lining to create a very special gift. Contour Card Zigzag stripes are wonderfully eye-catching. Printed on the Contour Card in shimmery gold or silver foil, zigzags convey your classic style, along with your love for a bit of pizzazz. Raised-ink personalization in your choice of typestyle. Comes with 50 Pinnacle pointed-flap envelopes. Opt for the hand-inserted lining to create a very special gift.